Distribution: Rainforests of south-east Queensland. Derivation of Name: Macadamia...after John Macadam. integrifolia...from Latin integer, entire and folium, a leaf, referring to the leaf margins which do not have teeth. Conservation Status: Listed as Vulnerable under the EPBC Act* (ie. facing a high risk of extinction in the wild in the medium-term future, as determined in accordance with prescribed criteria). Classified as 3VC- under the ROTAP * system. Macadamia has the distinction of being the only Australian native plant to be grown as a major commercial food crop (so far!). Two species, M.integrifolia and M.tetraphylla (and their cultivars), are grown in a number of countries including the United States (Hawaii, California), southern Africa and central America. The Macadamia nut industry commenced, not in Australia but in Hawaii where the nuts have been produced since the early 1900s. The Australian industry has expanded greatly since the 1970s and commercial plantations occur from northern New South Wales to north Queensland. 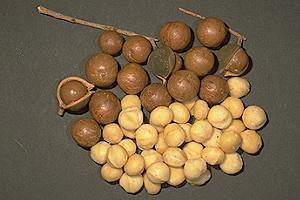 There are four species of Macadamia, all of which occur only in Australia. 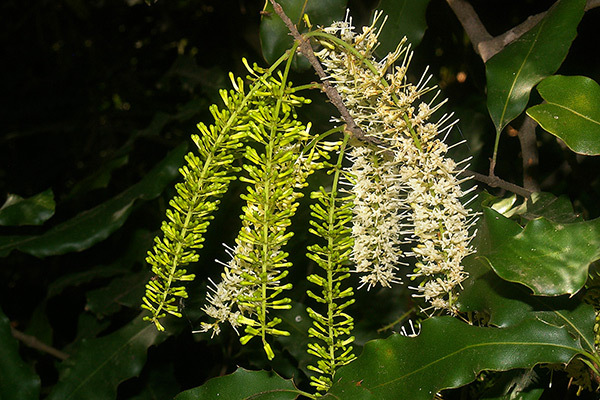 In addition to M.integrifolia, the other species are M.tetraphylla from northern NSW and southern Queensland; M.ternifolia from south-east Queensland and the endangered M.jansenii which is restricted to a small area near Bunderberg in Queensland. Until recently a total of about ten species were recognised but the others have been re-classified to different genera. M.integrifolia is a small to medium sized tree to about 15 metres with a bushy habit. The glossy leaves are oblong in shape to about 200mm long by 100 mm wide and often have wavy margins. Flowers are white and occur in pendulous racemes up to 300 mm long, usually in winter and spring. They are often hidden among the foliage. The fruits are globular and about 25 - 35 mm diameter. They have a hard, green outer layer and an extremely hard inner shell which protects the kernel. Even if it did not produce an edible nut, M.integrifolia would still be cultivated for its attractive, ornamental habit. It has proven to be hardy in a range of climates and soils but prefers good drainage and humus-rich soils. It will flower and set fruit in much cooler areas than its natural habitat. It is troubled by few pests and will tolerate moderate frosts. Propagation from seed is relatively easy - the seed should be sown when fresh. Cuttings are also successful but vegetative propagation is usually carried out by grafting or budding of select forms onto seedlings.